Belladonna berries come in two varieties: Ripened Belladonna Berries and Unripened Belladonna Berries. They are identical in appearance and effect and can be combined to create a potion with all four effects. 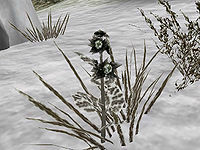 The unripened variety are the most common, growing in shrubs all over the warmer regions of Solstheim. 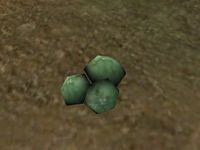 Ripened berries are less common, but are usually found growing immediately outside the entrances to barrows. 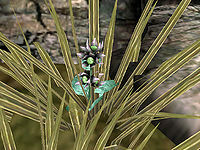 Ripened berries are also found on the corpses of spriggans. They can produce up to 3 berries. You will need one unit of ripened berries during the Rite of the Wolf Giver quest to cure yourself of Lycanthropy. The harvest quantity for Belladonna Berries depends on the source. Ripened Belladonna plants have a 100% chance of yielding berries, unripened plants have an 80% chance, and spriggans have a 60% chance for each of the three berries they can carry. To resist this ingredient's Drain Magicka effect, you can use Resist Magicka. There is a bug resulting from brewing a potion of Ripened and Unripened Belladonna Berries which causes subsequent potions brewed with the same Apparatuses, Intelligence and Luck to also have all four effects even if brewed with ingredients other than Belladonna Berries. If the potion you brew should yield one and only one of the effects of the Belladonna potion, it will instead have all four effects. This works with straight potions of Restore Magicka, Fortify Magicka, or Drain Magicka brewed from ingredients common on Vvardenfell. Exceptions include potions made with Daedra's Heart or Emerald. The bug will not occur if your Intelligence, Luck or Apparatuses are different from when you brewed the Belladonna potion. This page was last modified on 12 April 2018, at 23:50.